Having twins is a very, very exciting time for many, if not all parents. Be it you're having twin girls, twin boys or a gender of each, it sure is a joyous time calling for the celebration of the year! Then comes the time to think about your baby items. Everything will have to come in double - double high chairs, double strollers and of course, double cribs for twins. Read on to find out what are some of the amazing deals these leading brands have to offer this Black Friday and Cyber Monday Mega Sale! At 40" long and 28" wide, the DaVinci Kalani 2-in-1 Mini Crib & Twin Bed is of the perfect baby crib size that makes for one of the best cribs for small spaces. 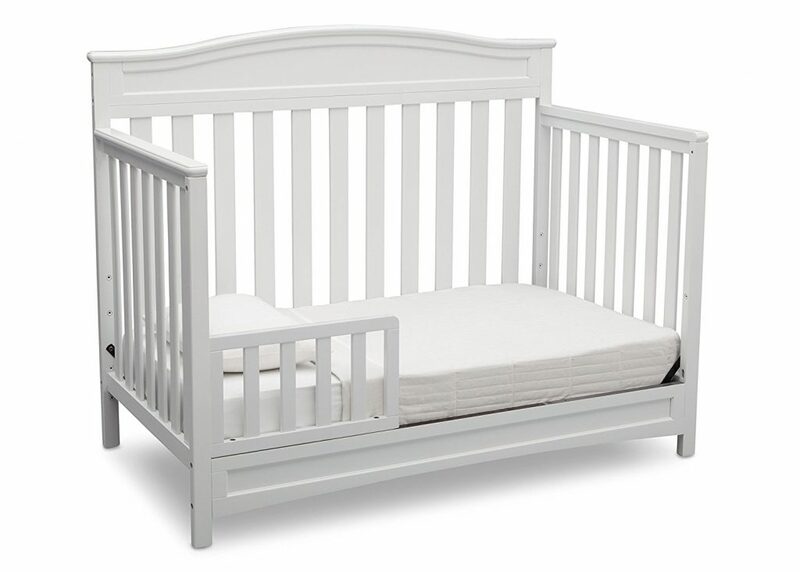 This small crib actually mirrors the award-winning Kalani 4-in-1 Crib's timeless design that is so well loved by parents across the world, but in a convenient mini-crib sizing. Which makes it perfect when you need two of them for your twins without cramping the size (and style) of your nursery. The 2-in-1 Mini Crib has the same soft, subtle curve as its bigger counterpart and the same lifetime functionality, and we especially love its lower profile crib which allow four mattress levels for you to adjust the height according to your child's growth for easy reach at each stage. They also make for the best convertible cribs that conveniently becomes twin-size beds once baby outgrows the crib. We like crib to toddler bed like this as it saves money in the long run because beyond the nursery years, you wouldn't need to buy two separate toddler beds again for your twins. It's worthy to note that the DaVinci Kalani 2-in-1 Mini Crib & Twin Bed is made of 100% sustainable New Zealand pine wood with a CARB II compliant MDF board over the metal mattress support and has a non-toxic multi-step painting process. To keep it short, these twin baby beds are very sturdy and safe for your little ones. We know many of you are after a grey crib as it seems to be a popular nursery choice these days - good news, this one here offers that colour option too, aside from 4 other colour finishes! If you have a really small room to play around as your nursery, let us recommend this ultimate space saver crib - the Alpha Mini Rocking Crib (the smallest mini crib from DaVinci) that makes for the best baby cribs for twins in small spaces. It is also the rarest of its kind with its removable castors and locking wheels that allow you to move it from one room to another easily so that you can keep babies nearby at all times. With its space-saving size, the Alpha Mini Rocking Crib comfortably fits through standard doorways so no trouble in that area. You can even keep this baby crib next to bed with such mobility. 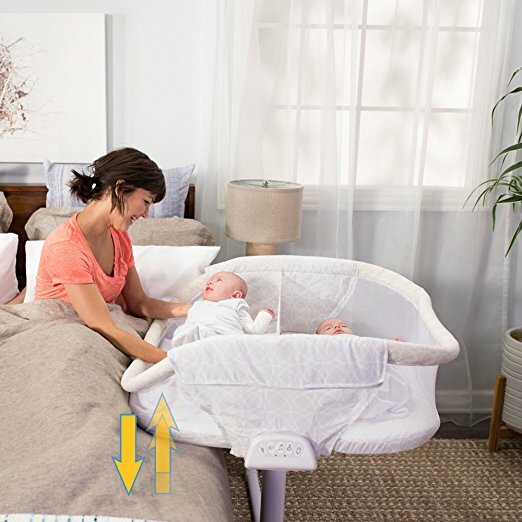 If you remove the wheels off as pictured left, this crib allows you to gently rock baby to bed right in the crib with its comforting, rocking feature. Rocking stops easily and let you set it at a sturdy standstill when desired. We think this an awesome feature to have when you have twins because this way, you can rock both babies to sleep simultaneously rather than one at a time at your glider. 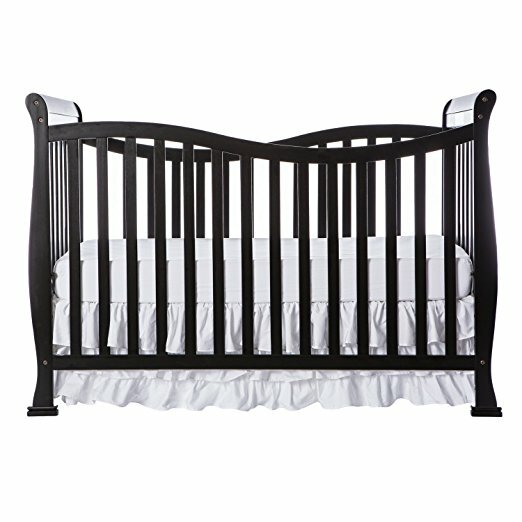 Similar to the Kalani 2-in-1 Mini Crib, the Alpha Mini Rocking Crib also has four adjustable mattress positions and has the same solid pine wood construction and finishes that meet international safety standards and includes a 1-year warranty. So for those in the hunt for space-saving twin baby furniture for your nursery, look no further- this twin cot is the way to go! 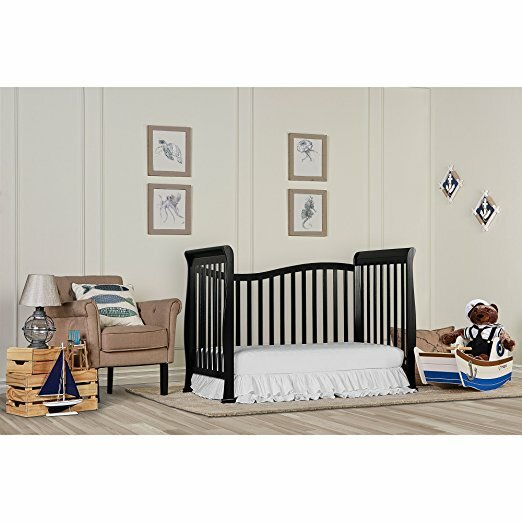 If you like the idea of cribs that turn into toddler beds, here's another option for you to consider - the Dream On Me 4 in 1 Aden Convertible Mini Crib. Even smaller than the DaVinci Kalani 2-in-1, this crib bed size is perfect for those that want a narrower fit because it measures at 23 inches wide only. Beautifully designed, it has a solid frame that features a stationary non-drop side rail design to provide the utmost product safety. For ease in reaching your baby, it sits low to the floor and features the convenience of a 3 position, adjustable mattress support system. Aside for your convenience, it is also for baby's safety because as we all know, babies grow at an astonishing rate - adjustable mattress heights like such minimise the danger of baby climbing or falling out. As a 4 in 1 baby bed, it is a lifetime crib that matures with your child from infancy through childhood to adulthood. Besides using it as it is, you can also convert it to a day bed, and for the adult years, change it from crib to bed (twin-size) with the choice of with or without a footboard. 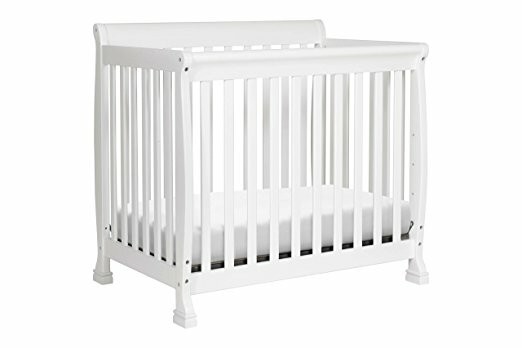 Among all the convertible baby cribs, this 4 in 1 crib is considered vey reasonably priced especially when it is constructed from solid wood (so you can be sure it is structurally sound and stable and will last through the years). 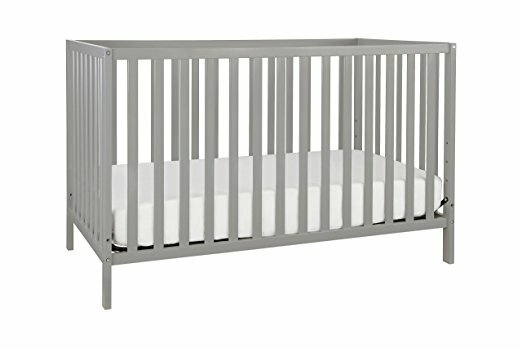 Best of all, the Dream On Me 4 in 1 Aden Convertible Mini Crib is available in 8 brilliant finishes (including the gray crib you're looking for!) so you can definitely find one that suits your theme or colour scheme. 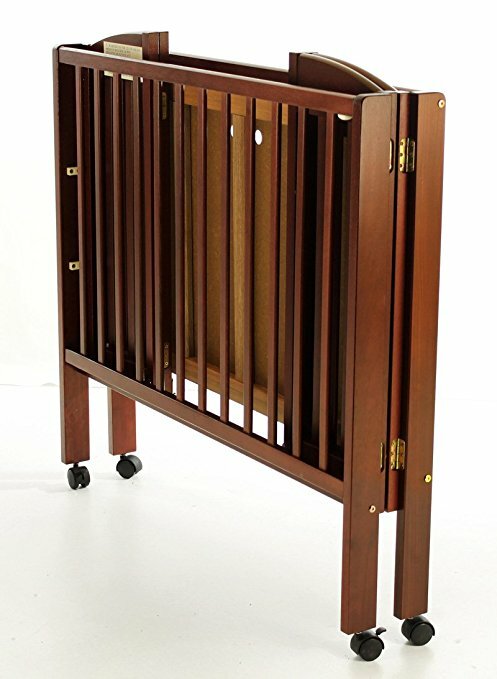 While we're on Dream On Me cribs, here's another space-saving crib - the 3 in 1 Portable Folding Stationary Side Crib for those with space constraint. Each nursery has different measurements - some may need a shorter but wider crib, while others can probably accommodate longer cribs but would have to compromise width - either way, we know you'd want to maximise baby's sleeping space in a room with limited space. While this baby bed size is not as small as other mini cribs that are reviewed above (it has a longer dimension), it is still considerably smaller than a standard size crib. 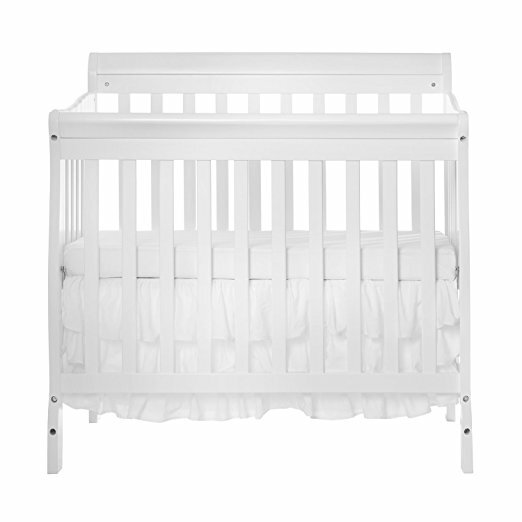 This 3 in one crib is perfect for those that are looking for a long but narrower cot for their little ones. Made of solid birchwood, its lightweight frame is sturdy and durable and as you can see from the picture left, it can be folded flat for storage which makes it perfect for travelling or second home like the grandparents'. 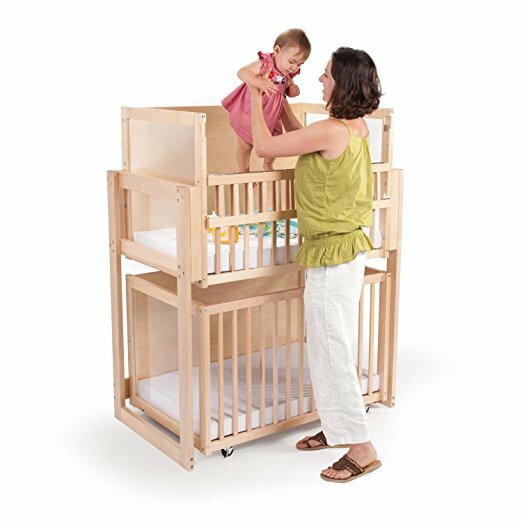 Like all Dream on Me cribs, this 3 in 1 baby bed has a stationary (non-drop side) rail system for safety purpose. 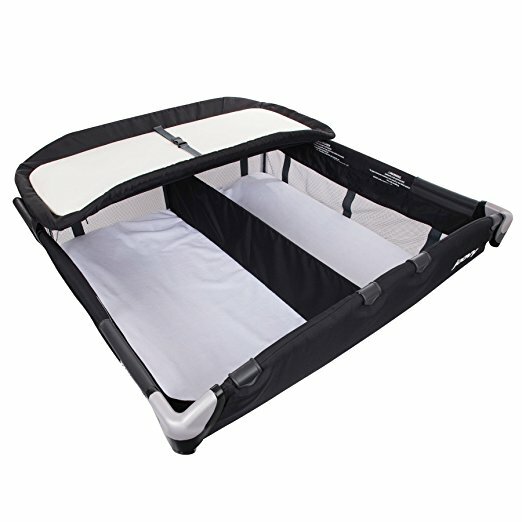 The Dream On Me 3 in 1 Portable Folding Stationary Side Crib is the only 3 level portable crib available in the market (well, at least we can't find another that comes close to it) that can be converted to a playpen or changing station easily in seconds. 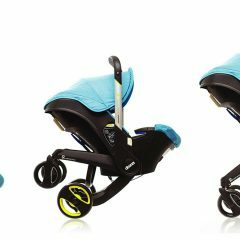 Dual hooded safety wheels with locking casters are provided to allow you to wheel it to your room and make it a baby side bed if say, a particular twin is fussing in his/her sleep. Available in 6 finishes, you can definitely find one to fit within your interior and colour scheme. For parents who simply do not have the space to put two cribs (even mini ones) in their nursery, don't worry, single crib is still workable and you do not need to worry about the abovementioned risks, thanks to this one wonderful invention - crib divider for twins! 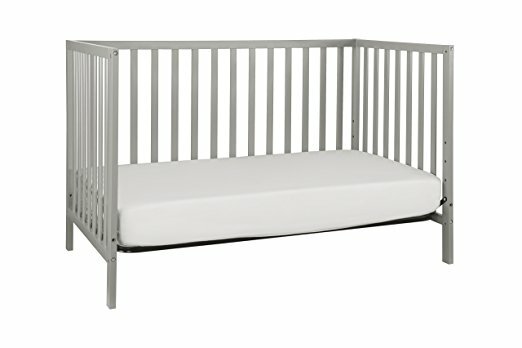 The Union 3-in-1 Convertible Crib is a standard twin size crib that measures at 52 inches long and 27 inches wide. With such dimensions, your twin babies will each still get sufficient personal space after separating them with a baby bed divider in the middle. One of the best affordable cribs available in the market, it is constructed from sustainable New Zealand pine wood and is available in three beautiful finishes. With four adjustable mattress levels, you can adjust the mattress height according to your babies' growth so that it is both convenient for you to tend to baby and prevent baby falling from bed. You can even convert it to a sidecar crib in its daybed mode if you wish to keep babies close by your bed at night. This is a perfect solution for those who want a twin co sleeper or those without a separate nursery room. As one of the most inexpensive cribs, we cannot recommend the Union 3-in-1 Convertible Crib enough for its high quality and practical functionability. 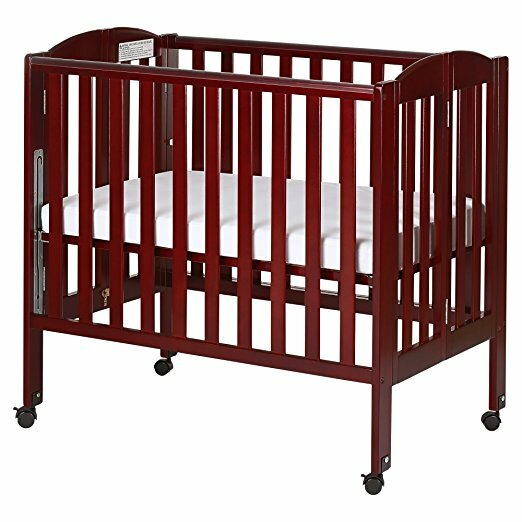 It is definitely one of the best choice for parents who need to sleep their twins in the same crib. BLACK FRIDAY FRENZY! SAVE 14% THIS BESTSELLER! ​​​​Another 4 in 1 baby crib but in full standard size, perhaps a little more as the Delta Children Emery 4-in-1 Crib measures at 58.8 inches long and 33 inches wide, this baby bed size is perfect for twins sharing the same crib without feeling cramped, even with a crib divider in the middle! As a multi-functional crib, it can be easily converted to a toddler bed, day bed and full size bed to adapt to baby's growth. 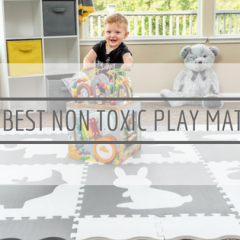 However, this may not 100% serve your purpose as you will need to get a separate toddler/full size bed for your other twin once babies outgrow their crib stage. Nonetheless, we do like how a toddler daybed support is included, unlike many others which you will need to buy separately. It is also made of strong and sturdy wood construction, and the three-position mattress height lets you adjust accordingly to babies' growth. Overall, we like (and also the reason we recommend) the Delta Children Emery 4-in-1 Crib as a simple baby crib but with generous sizing that makes it comfortable and roomy for twins even when they need to share the same crib. Of course, don't ever forget the crib divider to ensure you provide the safest sleeping environment for your little ones! 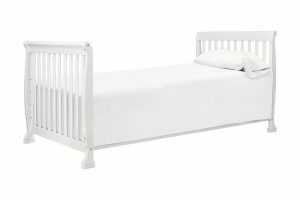 Another generously-sized baby bed crib is the Dream On Me Violet 7 in 1 Convertible Crib that measures at 58 inches long and 29 inches wide. As with the two other baby cribs recommended above, it provides sufficient individual sleeping space for each twin with a crib divider in the middle separating them. Apart from the main reason that is its size, we love how it has a timeless design with beautiful flowing sides that will coordinate with a wide variety of decorative style. Whether you're going for the richly decorated feel or if you lean towards minimalist styling, this crib will fit right in. 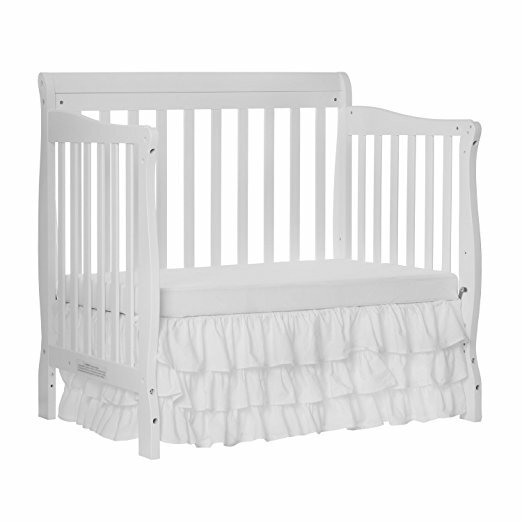 As to be expected from convertible crib sets, this 7 in 1 Dream On Me crib can be converted into a toddler bed, day bed, twin bed and full bed (with the latter two having the option of with or without footboard). While such convertibility is surely convenient and economical, with twins, you will need to get a separate bed for one when they eventually outgrow the crib phase whereby they wouldn't be able to share one crib anymore. Nonetheless, having the Violet 7 in 1 in daybed mode, with the mattress positioned at the lowest (there are four positions for you to adjust, by the way), can easily make do as a twin playpen when babies are older. Depending on whether you have a longer or wider room to play with, the Dream On Me Violet 7 in 1 Convertible Crib and Delta Children Emery 4-in-1 Crib are two very good choices (the former for longer rooms and the latter, wider) of big baby cribs for twins to sleep separately and comfortably in without compromising on style and space. We will be upfront with you - this awesome-looking double decker crib does not come cheap. But oh, if budget is not a constraint for you, the Whitney Brothers - Space Saver Two Level Crib is such a wonderful solution for all your space issue, no crib divider required! 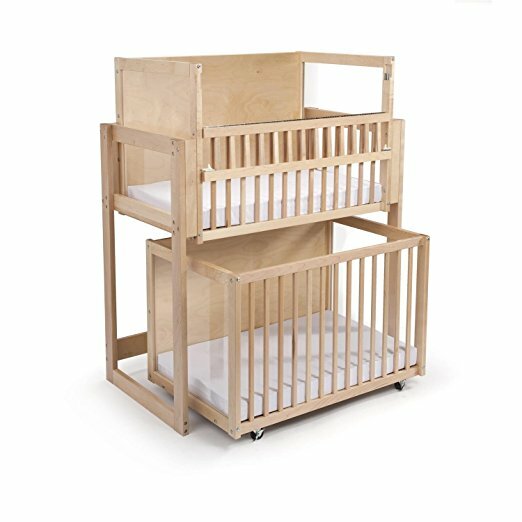 This two level crib provides two safe sleeping areas in one efficient, space-saving design that will counter any space limitation issue. 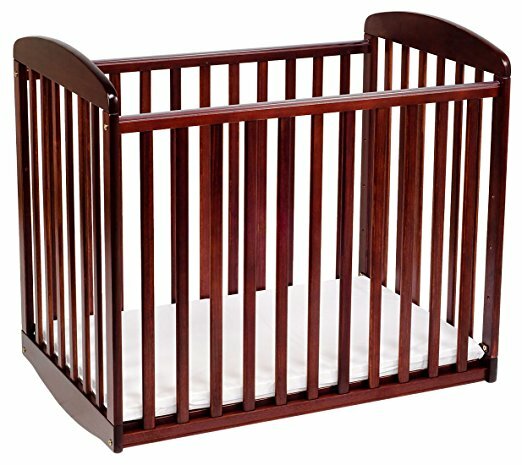 Made in the USA and constructed with maple wood, you can be sure this light wood crib with a natural finish is of uncompromising top notch quality that will last a lifetime. Aside from being beds for twins, this two-level crib is also ideal for caregivers, grandma's house, when the cousins come to visit, or even for one child, as the bottom crib can be moved to another room for naps or playtime. Plenty of versatility! One main concern many parents have for bunk cribs like such is that one child may feel confined being the one sleeping underneath. With this one here, there is no such worry - the bottom crib can be slid out so that baby can get exposure, in addition to making it easy for you to access to baby, too! The upper crib, on the other hand, is in a fixed position unit. If you worry about not being able to reach to baby, don't be - it has a folding front rail design for even the most petite parent to reach up, just look at the picture above! 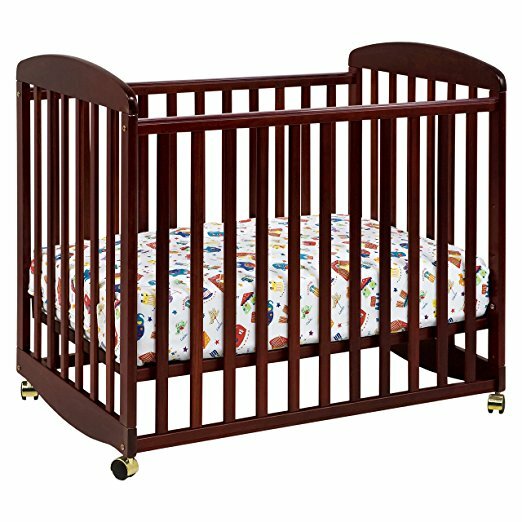 While the Whitney Brothers - Space Saver Two Level Crib is certainly on the expensive side, do note that it comes with two 3-inch thick, vinyl covered foam mattresses so you can use the crib immediately after it arrived without having to buy any other items separately. GreenGuard certified, it offers a lifetime warranty so truly, there is nothing to worry about the durability of this double-decker model! First off the list is this twin bassinet from Baby Trend - the Twin Nursery Center. 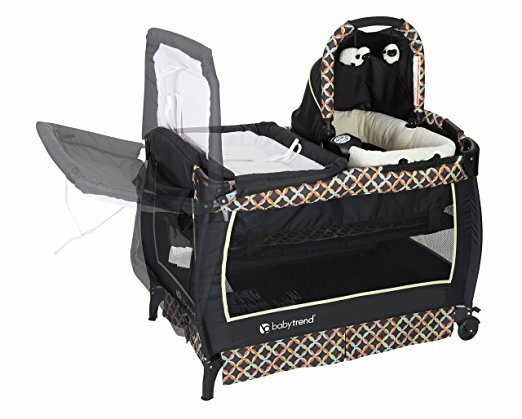 Comes with two removable rock-a-bye bassinets that lay side by side for your twins to sleep in, each bassinet comes with its own canopy and carry handle and is made of plush fabric with mesh sides for proper ventilation so that babies can sleep comfortably without feeling too hot. Once removed, each bassinet converts to a stand alone rocker and two hanging toys and electronic music center with volume control, nightlight and vibration will surely provide adequate entertainment to your babies. When the time calls for it, a flip away changing table lets you do your nappy duties without having to walk far so you can always keep an eye on the other twin, and a deluxe parent organizer that holds plentiful supply of diapers, toys and changing essentials is included as well. 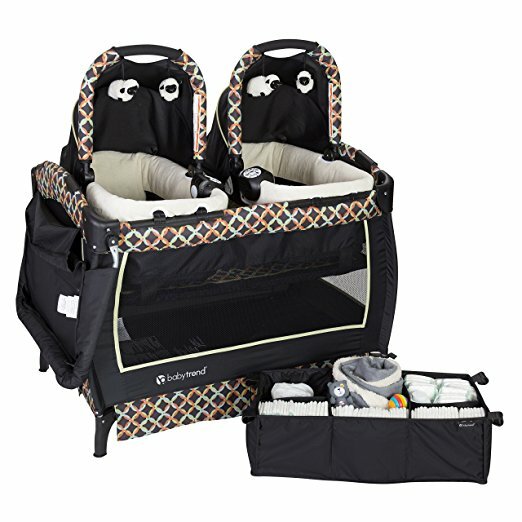 Even when your babies have eventually outgrow the bassinet phase, the Baby Trend Twin Nursery Center makes for one of the best pack and play for twins if you simply take the bassinets off. An easy one-hand locking mechanism makes it stable and stay in place for your little ones to play in, and if you need to move it to another room, the large wheels with brakes let you do so easily without fuss. So while some may think that getting a bassinet is not very economical as babies outgrow it so fast, the Baby Trend Twin Nursery Center will certainly change your mind with its practicality and multi-uses. And oh, it also includes a convenient travel/storage tote bag so if you'd ever need to go travelling with your twins, this is the perfect solution for parents on-the-go! 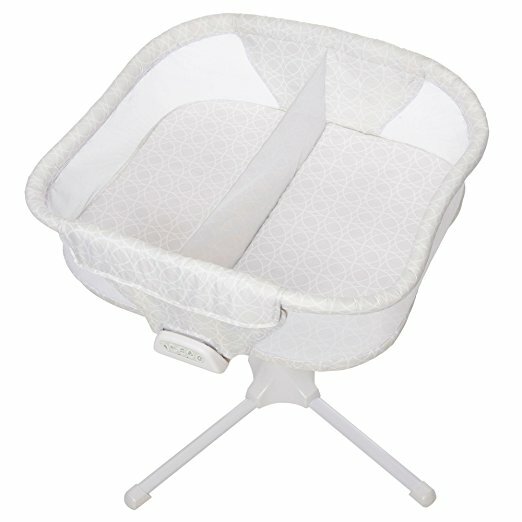 Another double bassinet that we love and will recommend is the Joovy Room2 Twin Nursery Center. Before you get too excited looking at its price, we have to tell you that this is a separate item from a playard. 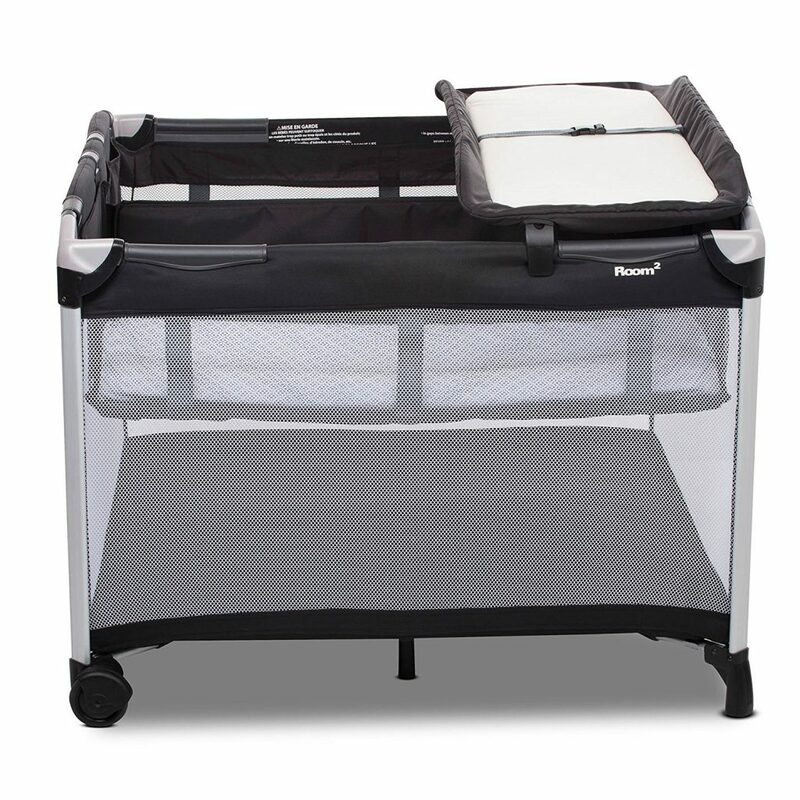 You can most definitely make it similar to Baby Trend's as a twin pack n play (aside from being a twin baby bassinet) but you will have to purchase the playard separately. 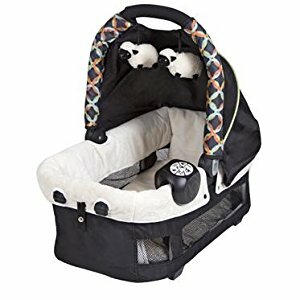 Regardless, a combination purchase as such is still slightly cheaper than Baby Trend's, as the nursery center does not come with their own canopies and accessories i.e. toys, music station. Nonetheless, it does include a double bassinet and changing table, of which the latter is removable and machine-washable and can be kept out of the way by flipping it over to the side of the playard if not in use. The large bassinet is divided by a center divider which is equally removable if only one twin needs to sleep (s/he then has a bigger space), otherwise, zip the divider in place and each baby will have their own separate napping area. The Joovy Room2 Twin Nursery Center is the perfect twin pack and play if you already have a playard. It should fit most standard size playard but it's be best if you do your measurements first to ensure a perfect fit. 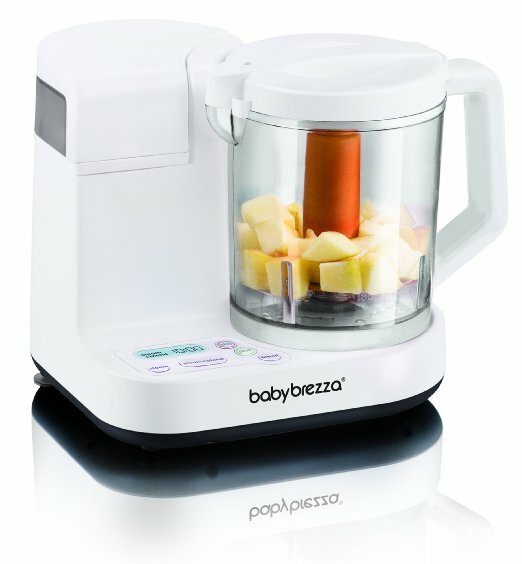 This practical accessory is easy to install and handy to have around be it you have one baby, twins or even multiples! Last but not least, is this HALO Bassinest Twin Sleeper Double Bassinet for families expecting twins. 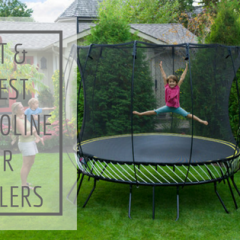 This is the latest addition to the brand's collection of bassinets (which is pretty amazing - check out our thorough review on them here) which we can confidently say is one of its kind. For example, it is the only space-saving bassinet for twins that rotates 360 degrees for convenience and safety. This means you can bring either of your twins right next to you for needed soothing or nighttime feedings without you leaving the comfort of your bed. Ingeniously designed to tuck under your bed and is height adjustable to fit most beds, this twin sleeper is one crib attached to bed that your little ones can sleep as close to you (and to each other) as possible! 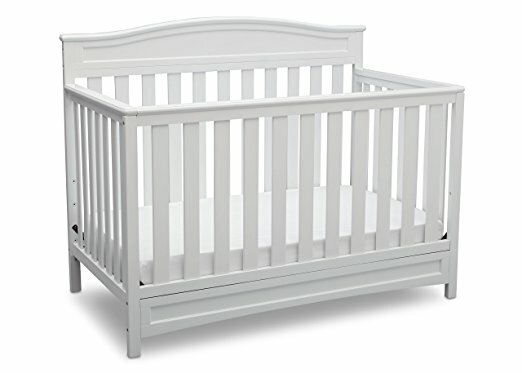 Not voted as one of the best rated cribs for no reason, this bassinet has side walls that easily lowers (and auto-return) with gentle pressure so that you can easily tend to your twins without getting out of bed. If desired, it allows you to lock it in upright position. This makes it ideal for all moms of multiples, but especially moms who've had c-sections as you do not have to get out of bed to tend to both babies. The mesh divider ensures your little ones can see and comfort each other, in addition to letting you look at them while you're laying down yourself. Besides, it offers maximum breathability too and provide your twins the togetherness they crave, while ensuring the safety of separate sleep spaces! With the inclusion of 2 waterproof mattress pads, 2 polyester fitted sheets and 2 100% cotton fitted sheets, we think the price of this bedside crib is pretty justifiable. This includes a Soothing Center (with 30 minute auto shut off) that has 2-level nightlight, 2-level vibration, 3 lullabies, 3 soothing sounds and a back-to-bed reminder, in addition to being a crib with storage with 2 pockets for easy access to nighttime essentials. For those that want a co sleeper for twins to attest to the comfort that comes from having their twins close to each other, the HALO Bassinest Twin Sleeper Double Bassinet is no doubt the best twin size cot that provides the utmost benefits of bed-sharing for your twins, but without the associated risks!